The Devialet Phantom – can you recognize quality sound? When you watch a video on YouTube, you can tell when quality is lacking. The image on your screen is pixelated, the sound is tinny, and while you can figure out what’s happening, you know searching for another of the same video will likely yield better results. Can you tell when a speaker at home is lacking quality? Do you keep an ear out for how it handles highs and lows? If you not only notice that sort of thing but are appalled when it doesn’t live up to your expectations, then you’re likely on the hunt for a better speaker. 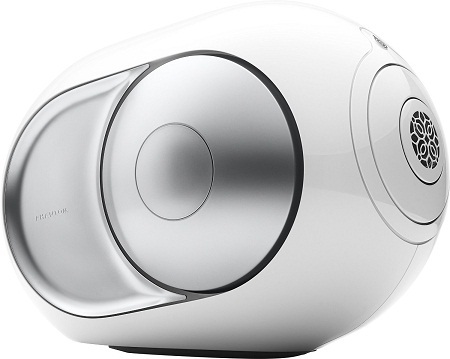 If Devialet isn’t all talk, it seems as though the Phantom might have something to offer. Their creation is a 3000 Watt speaker that is said to give an ultra-dense sound that you can feel. They tout no distortion, saturation, or background noise from 16-25khz. While they say it will replace any system you have, they also recommend getting 2 or more for an even more immersive sound. That is likely due to speakers being prone to having a sweet spot where you can hear the sound the best from one angle to the speaker than another. This can play all your music wirelessly through Bluetooth or WiFi, and is going to cost you a pretty penny at $2,390, coming in silver or white, though the latter only has 750 Watts and costs $1,990. If you’re an audiophile and it lives up to the hype, then it sounds like it might be worth the trouble.